Hiya so im using my disc for battle for middle earth 1. im trying to get the online t3a to work for it. i have patch 1.06 installed. i am running windows 10. i signed up and made a profile online with t3a for a server and account and the problem im having is it keeps telling me login timed out. You have to follow the instructions in the pinned topic about the options.ini file. I have the version downloaded from forshire for bfme1, on windows 10, downloaded fine, but when I go to open theres 2 files for it. First looks like regular game opens a t3a launcher but does nothing. The second one just says "has stopped working" and does nothing. I've let them all through my firewall just in case and tried redownloading and updating patches, running compatability mode, ect... nothing. Also, all the tools that came with it do the same "has stopped working" thing. I made the options.ini file already and that didn't help. Edited by Durins Bane, 20 March 2018 - 06:00 AM. Try to follow the regular installartion instructions here in the forum. Hello. I need help. My game can't connect to the Internet. I go to multiplayer >>> choosing internet and game says that my PC doesn't connected to Internet. Maybe i am wrong and to play T3A i need to use Local game? Not the internet? Windows 7, game version T3A 1.06. I tryed even to close and delete my firewall. It is not because it. Edited by XzibiTNooB, 08 April 2018 - 08:33 AM. You have to start the game from the launcher. Sure i start with T3A launcher. Using Hook, anyway start with launcher. Any other suggestions? Port on router i drop too. 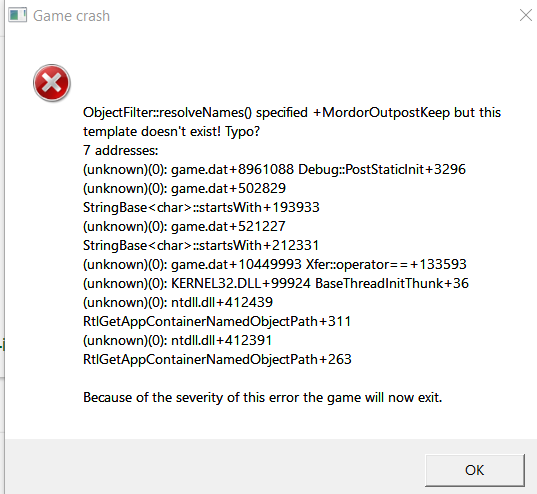 I've just downloaded the all-in-one patch installer for bfme 1 and when I try to run the game, it comes up with the attached error. I 'm on Windows 7. EDIT: the game is launching normally, but if I go to the online section and put my revora info in I get "login timed out"
Edited by Quality, 30 June 2018 - 10:32 AM. See the connection issues topic. Also, don't use your revora login but your server account instead. I can't install the T3A launcher, so I 'd say this is an installation issue. Well, if you can already go to the online interface and enter your login data, then the launcher is already installed. In any case, make sure to right-click and run the launcher as admin. Update: Managed to install the launcher but now when I get to this screen: http://i.prntscr.com...LQ9aeML6W_w.png and click BFME nothing happens. Same thing with the regular launcher, the circle icon next to the mouse pops up for a second then dissapears and nothing starts up (even checked the process list on the task manager and didn't find anything). I 've tried running as admin and compat mode on both but nothing worked. I 've already added the ini file so that's not the problem.